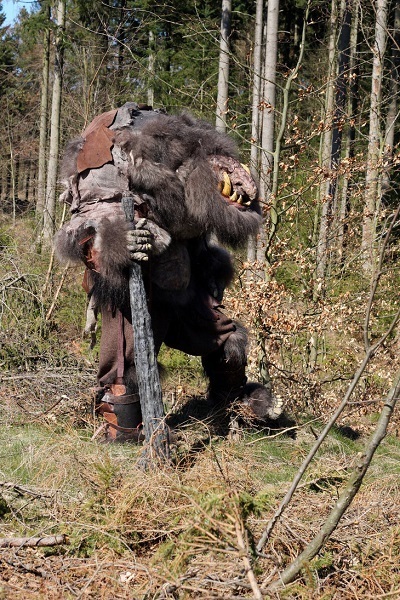 Trolls are known for their ferocity, but Guttlecraw puts most trolls to shame- he is ferocity incarnate! Guttlecraw is 12 feet tall, 600 plus pounds of pure mean! When prepared for battle he goes in plate armor and with his pet great gryphon, Kasteel, but he is scary without armor as well. Giant, stringy haired, with red rimmed eyes and huge fangs. Mazes/Labyrinths Negative Combat bonuses 1/2, Skills -15% For 1D4 days! The youngest of 13 brothers, 4 of which work for Lady Daera Kaze and Lady Shara Lechellsa as well, Guttlecraw is the best fighter of the group. Due to a disagreement with the 3 Furies in the Northern Hinterlands, the whole family moved south. During a fight in the Old Kingdom led by the Middle Kingdoms, the trolls joined their brother southern trolls, and routed the soldiers. Lady Daera and Lady Shara had a group find Guttlecraw and his brothers, and asked that they work for the Ladies. Guttlecraw and 4 of his brothers agreed, and they have done much fighting under the Middle Kingdom banner, which makes them happy! It was on a quest to try to recruit the other brothers that Guttlecraw found his two favorite things- the great gryphon Kasteel and the evil, soul-drinking pike, Sauromorgue. They were found together, in the Old Kingdom Mountains. Kasteel is just as vicious as Guttlecraw, and it seems as if they were made for each other. Sauromorgue may be the most bloodthirsty of all three!